Here are two maudiae-type slipper orchidsthat I bought at the recent orchid show held in Washington D.C. Most of these hybrids are being bred in Taiwan (slipper orchids are from south-east Asia) and the quality is outstanding. Growers usually have a batch of identical seedlings in bloom, and its fun to go through and pick out the best ones. ‘Best’, is of course, subjective but most slipper orchid enthusiasts will agree that if you look for flowers that are symmetrical, show clear color and boast a good flat dorsal sepal(that’s the striped one at the top of the flower that ends in a point) you can’t go wrong. Then, of course, you have to like the flower, so that you’ll enjoy it once its home and blooming on your windowsill (the flowers can last six weeks or more). The orchid to the top is 50% sukhakulii, a species from Thailand that impart wide spotted petals to its progeny. Below is what is known as a vini-color hybrid–the goal with this kind of breedingis to get wine colored flowers–sin fact, some of these can be an extremely dark wine-red, or practically black. 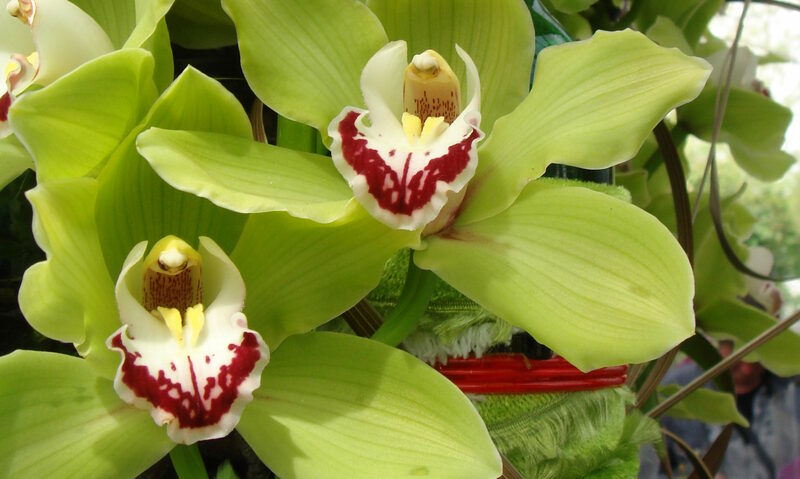 The vini colored slipper orchids are best admired while sipping a glass of claret red.